Wilson Camargo Junior first met Carlin in a traveler’s bar in Melbourne, Australia, around 8,760 miles from his Brazilian home. He’d moved from Brazil because of the renewable energy industry, booming in Australia at the time. In under two years there, he started his own company installing telecoms devices, met his life partner, and started a family. 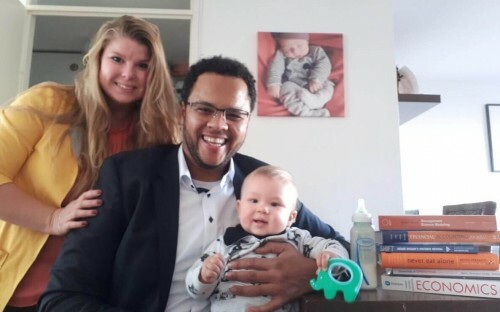 Carlin is Dutch, and that’s partly how Wilson ended up in the Netherlands on the full-time MBA at Rotterdam School of Management (RSM) this year. The rest is down to the MBA program itself. “I chose RSM mostly because they have sustainability as part of the core course, and also because of the focus on personal reflection that they bring to MBA participants,” Wilson recalls, speaking from an impromptu family boat trip, somewhere between Amsterdam and Rotterdam. “It’s not only an MBA program where you sit down and have classes,” he continues. “RSM encourages you to reflect on your career; what you want to do and how you can use your strengths to develop yourself. Wilson is just one of many students drawn to the Netherlands for its sustainable business practices, vibrant startup scene, and emphasis on work-life balance. The Netherlands was ranked the sixth happiest country in the world in the UN’s World Happiness Report in 2018. On the MBA at RSM, 97% of students are international, representing close to 40 different countries. Every MBA student goes through RSM’s flagship Personal Leadership Development program, a series of personal and professional coaching workshops spread throughout the year, and designed to develop a student’ sense of self, helping them identify their strengths and motivations. Wilson will complete the RSM MBA program in December, and is set to graduate in March next year. He plans to stay in the Netherlands and work in the renewables space, whether that’s by joining a company or starting one of his own. After his MBA, he’ll look for visa sponsorship from a company, but will also apply for a partnership visa. Internationals at RSM are supported with their visa and residence permit applications throughout their MBA experience. Since Wilson came back from his summer vacation in September, he says he’s been blown away by the effort the RSM Career Center has put in to connecting international students to the local jobs market. In a matter of weeks, he had four companies expressing an interest in his profile. “They got to know my CV because of the RSM Career Center,” he says. As a result, Wilson landed an internship with Allego, a leading provider of charging solutions for electric vehicles, based in Arnhem. He was also invited to Rotterdam Partners’ Red Carpet Dinner, an event which welcomes newly-arrived international companies to the city. He represented Brazil there, alongside the Brazilian ambassador to the Netherlands. Wilson says Rotterdam School of Management encourages MBA students to network from the start. For internationals, he notes, networking is especially important, and having that RSM brand attached to your profile can definitely help. One thing that stands out in his memory is an optional assignment he took up as part of a communications course led by visiting faculty member Nicolas Constantinesco. Wilson was asked to send 15 emails, or LinkedIn messages, posing a question to people who could help his career progression, but who he didn’t know. He did it. He asked 15 people questions, and got 11 answers back.